had little of substance to report. tant, and he was pleased with it. women care," said Mrs. Squires. would be discharged this week. and kefiya on his head. against Israel from Jordanian soil. has been quiet since 1981.
left before Peres arrived there. conciliation, insisted on by Likud. vitality of cor growing coaannity. for Jewist hfe and creativay lor us. Dedicate' nsn ,i ih4j m mm wm&SL. growing m the radiant Florida Sun. Tm ii i sal Kzr. ifoj-sr. :>'>. giver and for the recipient. is the "nedavah" given properly. of both G-d and man. the Temple stood in ancient times. financial aid intended for him. been received by Popes before. gesture no less than a formal one. tuary of the Haram Al-Sharif,"
members and angry Arab crowds. rested so far in the case. the car from which police Sgt. Vienna with his wife and family. with his family January 22. 0. of all kinds... Call Mr. Heller 392-0876 State Lie. # CGC028611 Insured. think they are nice people . ters begin to approach Lebanon's. building or two can hurt, too. to the President's press secretary. judice Nice People approve of. was for a good cause, i.e. ours. dividuals but the whole society. only one who should be. Eli Ahdut, one of the founders. on the settlement with his wife. cannot accept new members now. where we can make a difference." ficials, including Deputy Prime Minister Yitzhak Shamir. is too much attention to our trough Feb. 28.
look "for that which unites us"
terested in a summit meeting, but only in the Middle East. league Ezer Weizman's meeting with Mubarak in Cairo. Israel in more than a decade. morale and hope for the future. tunate things they've ever done." ... Halting 'Slippage' .. .
Jewish life and Torah learning." ding to chairman Henry Yusem. ment will be somewhat "invalid." Olivier and with Peter Ustinov. his wife Rita and their two sons. ty, her first time in South Florida. gifts of $100 are requested. nout on Sunday to do them honor. Israel Bonds drive in the Village. dition to good golf and good food. Do You Belong To Any Of These? SUNDAY and encourages you, their members, to take part. you feel like you do belong as indeed every Jew does! volunteer for Super Sunday. Please, do it today. Bernard Elish, Milton Lieberman and Jerome Gilbert. cases assigned by th<> court. leader," said Marion Leib, chair. Beduin tribes in the desert. University in England, a J.D. INC AIR FARE FROM NY"
New York Times a hit! TKTS: MATS S15. 13. 11: EVES: 117. 15. 1? Tickeis on sale al B 0 Select A Sea! A I.M LSMIW Si MMhR. space program. Entering in 1978. Discovery Flight in August, 1984.
and women dare great things." change things by 180 degrees. in Israel on the Ras Burka affair." travel, study, adventure and cross-cultural experience. WHAT DO YOU GET FOR $109,900 IN BOCA DEL MAR? Dinner, held at the home of Bud and Shirley Seretean in Boca Raton. and as a civil rights activist. Mildred Levine, and Rabbi Marshall Meyer, the guest speaker. Cohen, Dollsey and Seymour Rappaport. Left to right, Richard and Carole Siemens, Sherry and Kenneth ., ... ..
Left to right, Ken Endelson, Jim Nobil, Shep Kaufman, Seymour Rappaport, Ben Pressner. Left to right, Mark and Jo Ann Levy, Barbara Goldman, Arthur Left to right, Ben and Clarice Pressner, Frieda and Sam Golub. h White, Edna and Sydney Jarlcow. the estate of the decedent. the laws of intestate succession. dent. The following is the "will"
C. $20,000.00 in value of the remaining assets of my estate. above to my minor children who survive me. 50 percent to my lineal descendants. stead, be paid to his court-appointed guardian. bond paid from the guardianship assets. she spent any of the child's money. assets of the guardianship without any further restriction or control. the property she receives from my estate. taining approval from the court after notice to my children. with due notice to all of my and my wife's nearest relatives. I have executed this instrument on the day of-------, 198--. law office of Shutts and Bowen. "Taxing Matters" is edited by Mr.
Kirsner on behalf of the JCF Legal and Tax Committee. the need to reach out," said Dr.
indeed, of the human spirit." by more than $5 million. will be ready in a year's time. AN ISRAEL BOND FOR YOUR I.R.A. at the same time give you an attractive annual return. $2,000, or integral multiples of $2,000. much more severe side effects. "At this point," noted Dr.
KabiVitrum in Stockholm, and Dr.
and Japan to produce the drug. properties of the proposed drug. of victims of heart attacks. who with fellow biophysicist Dr.
Miniplat of Kibbutz Ein Shmer. ing the effects of embolisms. in Hungary for over 1,000 years. ly to Hungarian but to Jewish life. tact Dena Feldman at 395-3640.
the dominant need at the moment. child to the beach another day. down and read that book later. The child's need is more pressing. program for the period 1985-1990. Wednesday, February 19, 1986 at 8:00 P.M.
"A Quality Education for the Total Child"
he illustrates on the large pad, at the Book Fair. "When did you become a writer?" take if I would like that career?" and feelings about his books." selecting what they shall read. Jem at the Satellite Campus. ceremony at Masada Israel Imports. opportunity to touch the ritual ob-. bakuk for the wine bottle. There was also music in the air. playing the chalil and harmonica. that world truly came to life. their lives in space exploration. pose in our lives and goals in our hearts. was a loss for Jews all over the world. concentrate, work hard, and dedicate themselves. GOLF: SHOTGUN TEAM BEST BALL 9:00 a.m.
TENNIS: DOUBLES ROUND ROBIN 10:00 a.m.
Schools Out-Center's In (3-12 yrs) Mon., Feb. 17 Fn Mar 28 Fri., Apr. 18 9:30 a.m.4 p.m. T.B.A. Watch for More Details!! Spring Fling (3-12 yrs.) Mon., Mar. 31-Fri., Apr. 4 Watch for Details'! 9:30 a.m.-4 p.m T.B.A. Bus Service Mon. Thru Thurs. (from Addison, Mizner & Verde.) (Boca Academy has added J.C.C. to its route) Call Bari for Details!! Pre/Post Program Care Mon. thru Thurs. 2:30-6 p.m. Call Bari for Details!! Ceramic Birthday Parties (ages 5-12 years) CallBerlfor Details!! Tween Travel (grades 6-3) March 30-Aprll 4 (Points North) Call for Info. B.B.Y.O. High School Teen Youth Group Call Bar! for Info. "Waterproofing Your Toddler' Begins in March Call for Details!! Toddler Swim Team (3 yrs. & u p) Begins in March Call for Details!! College Volleyball Nights Sundays: Mar. 16 & Apr. 20 7-10 p.m. Free mem. (JCC or Hillel) $2 non-mem. When Parents Divorce: Wed., Feb. 19-March 12 For Parents and Children (7-10 yrs.) 67:30 p.m. Call for Details! All Classes at Levis JCC unless otherwise noted. family would like to participate. Center Registration Office, with the specified fees. of participants for each class is reached. 5. A $2.00 Late Fee will be charged tor registering after deadline. * Members have first priority for claas sign up. cancellation by a participant unless the place can be filled. financially possible. Therefore, your suggestions and ideas are appreciated. administrative committees of the Center, and to thereby assist In Its growth and development. Jennifer Herbst and Sam Gross. when we say, "I am a Jew." Saturday, Feb. 22, 8:30 p.m.
n Awwt Cmm*' *** *'""
336 Spanish River Boulevard, N.W. filled activity. For more information, contact Bari at S95-55U6. members wil be charged $2. brunch includes two bagels, lU lb. will be given. Bagels and coffee. of New York City. Mr. and Mrs.
Smirnov of the Soviet Union. Cincinnati, Ohio. Mr. and Mrs. Initial screening in Florida. Salary negotiable. Hotel, Friday, Feb. 14, 10:30 a.m.
tickets available for "Shalom 86"
at Temple Beth El in Boca Raton. remarkable literary background and an outstanding sense of humor. Members and their guests are cordially invited to attend. Refreshments will be served. For more information call 483-6878. Cafeteria, 6590 Verde Trail, Boca, Saturday morning 9:30 a.m.
Maariv, call Rabbi Mark Dratch. Phone: 368-9047.
evening at 8:15 p.m., Saturday at 9:30 a.m.
dress: 8177 W. Glades Road, Suite 214, Boca Raton, FL 33434.
vative. Phone 495-0466 and 495-1300. Cantor Louis Hershman. services 8:30 a.m. and 6 p.m.
333 S.W. Fourth Avenue, Boca Raton, Florida 38432. Reform. Daily Minyans at 8:45 a.m. and 5 p-m.
eagles and brought you to me." ewish Floridian of South County. Khn. (Beth Israel-Rubin Memorial Chapel). J0- \ of King. Point. Delray Beach. p.m. at the Temple, 2475 W.
Atlantic Ave., Delray. Tickets $8. Also includes "meet the artist"
session, Sunday, Feb. 16, 1 p.m.
tion call Adele Agin 499-6338.
a.m. at the Temple, 7099 W.
speaker will be Dr. Ian Goldbaum. by Jack Bunis. Ladies invited. hand side of the street. mons visitors bureau in Mahattan. order to get the budget balanced. fort to flee advancing forces. and that he is presently stateless. tivist, still has not published it. weekly stood by its account. during his talks in Bonn. while in Israel it can and does ..
yerida figures at over 90,000.
they cannot get along . held Feb. 20-27. This "week"
Singles Column, P.O. Box 012973, Miami, Florida 33101. ORT, and so on . Publlx Bakeries open at 8:00 A.M.
slightly to become life, liberty. Second Class <?! * < Ma Helen Fla USPS SSO 2tt ISSN 02744114<br /> POSTMASTER: Send address change* to The Jewish Floridian. Atfvertiaiac Urartar. Stan Laeeer. Ffcaa* Witt? 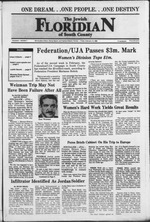 fxcials, including Deputy Prime Minister Yitzhak Shamir. their homes to others .. .